In the 1970s, American attorney Alfred H. Moses was approached on the streets of Bucharest by young Jews seeking help to emigrate from Communist Romania to Israel. This became Moses’ mission until the Communist regime fell in 1989. In the ensuing years, he periodically met with dictator Nicolae Ceausescu to confirm the right of Jews to freely leave the country. In recognition of Moses’ work, President Clinton appointed him as his first ambassador to Romania (1994 – 1997), where Moses played a key role in helping Romania move from its Communist past to democracy and to establish a free economy. 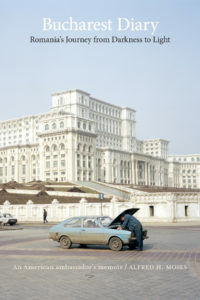 In his new book, Bucharest Diary: An American Ambassador’s Journey, Moses includes first-hand accounts of the diplomacy, both public and private, that helped Romania recover from four decades of Communist rule. As ambassador, he facilitated negotiations between Romania and neighboring Hungary and Ukraine that resulted in treaties resolving border and other disputes. As a result, Romania was invited to join NATO and the European Union, and currently has the fastest growing economy in Eastern Europe. For his efforts, Moses was awarded the Marc Cruce medal by the Romanian Government, the only American to receive this distinction. Moses is chairman of UN Watch, the author of several books, and has written articles for publications including The New York Times and The Washington Post. Moses also served as special counsel to President Carter (1980 – 1981) and special presidential envoy for the Cyprus conflict (1999 – 2001). In conversation with Senator Chris Van Hollen. Book signing and reception to follow.